World House Interdesign 2007 was an international conference hosted by the IwB in partnership with the International Council of Societies of Industrial Design (Icsid), the Harbinger Foundation, and the Canada Mortgage and Housing Corporation. Each year, Icsid and a local host organize an Interdesign. The IwB collaboration was the 36th annual Interdesign and was part of Icsid’s 50th anniversary celebrations. 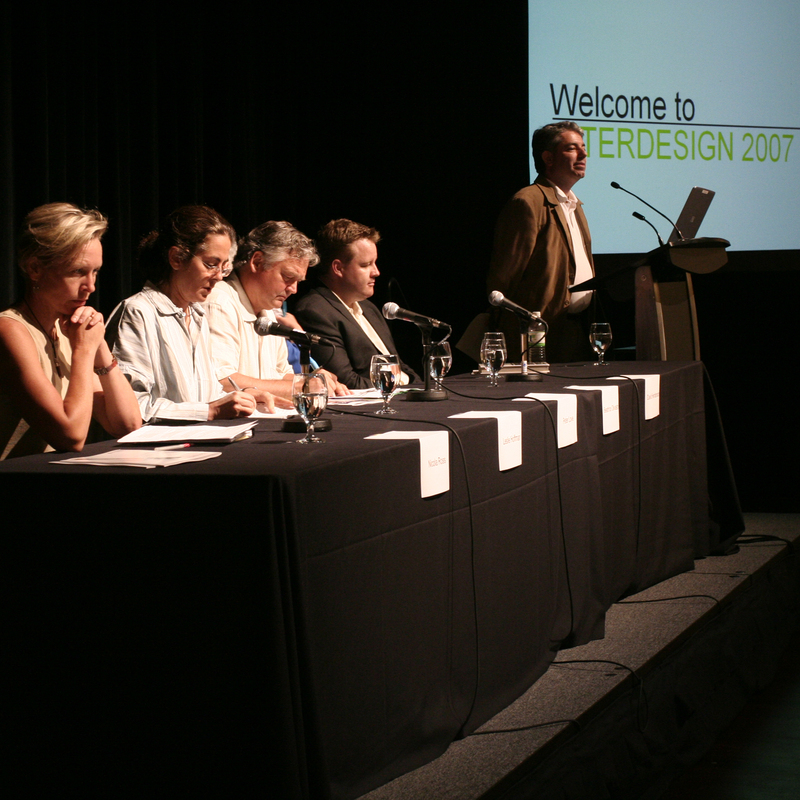 The theme of Interdesign 2007 was “Sustainable Housing and Water: Local and Global Challenges.” The conference took place from June 24 to 30 in Toronto. The event brought together students, professionals, and faculty in the field of design from around the world to tackle four local design challenges in the Greater Toronto Region: the revitalization in Toronto’s emerging waterfront redevelopment, sustainability at the new Downsview Park, capacity building in the Weston-Mt. Dennis area of Toronto, and resource conservation in the Town of Port Perry. To be truly interdisciplinary we looked to a precedent at Icsid of how people worked together across the world to solve global problems and adapted this using the Institute’s methods to generate our own collaborative design methodology of charretting. The objective of the World House Interdesign Conference was to test the Institute’s philosophy: whether design can be built into a knowledge system that can address issues of global relevance, such as sustainable housing and water conservation and be applied appropriately to local situations. The Interdesign program brought together over 150 designers, educators, students, and practitioners from around the world to discuss collaboration and interdisciplinary problem solving on pressing issues around housing and water. 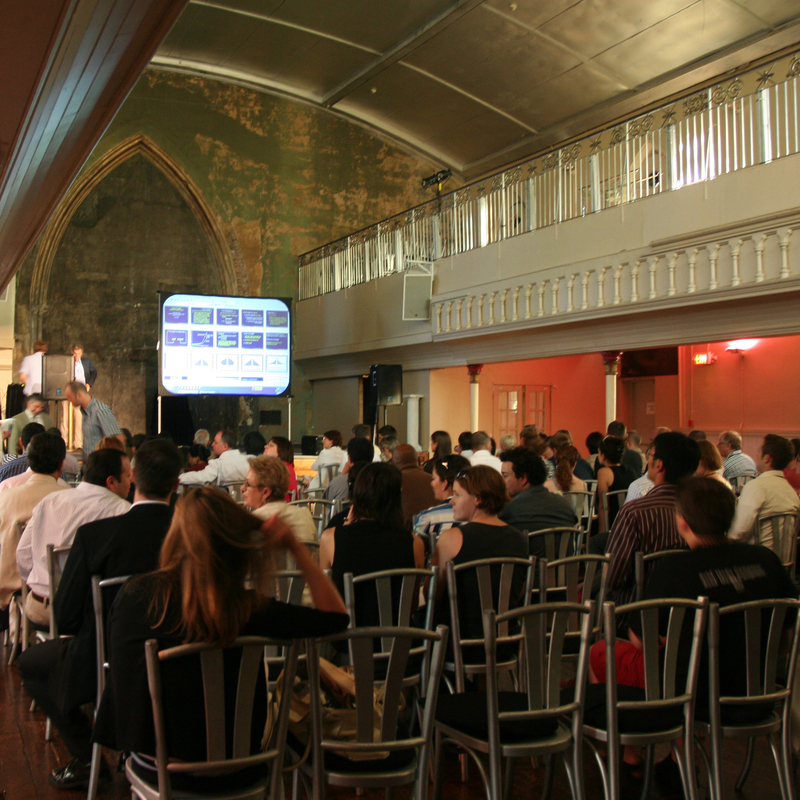 The 7-day conference was composed of a three-day charrette, lecture series, social events, and site visits. The lecture series included talks by scholar Thomas Homer-Dixon, co-founder of IDEO Bill Moggridge, Leslie Hoffman a pioneer in the field of sustainable architecture and agriculture, Peter Love, Ontario’s first Chief Energy Conservation Officer, Nicola Ross a leading environmental writer as well as many others prominent local and international speakers that attended the Conference including Peter Zec, president of Icsid from 2005-2007 and Carlos Hinrichsen, Icsid President Elect. In organizing the Interdesign, the IwB stressed Icsid’s intercultural emphasis, but also relied on its own charrette methodology which favours community participation and interdisciplinary design participation. The work conducted at Interdesign 2007 influenced the shape of all subsequent IwB charrettes. It showed the valuable role the Institute could play in shaping communities both locally and internationally by fostering capacity building through collaborative design practice. The solutions proposed during Interdesign 2007 demonstrated how one event could instigate both top-down and bottom-up solutions by bringing together diverse stakeholders and, most importantly, produce actionable results for the case study sites and communities. The Waterfront case study, led to a design brief and an actual call for proposals, and the eventual development of both the Parkette and Sherbourne Park and Sugar Beach. In Downsview Park, the signage proposed by charrette teams was installed to promote better use of the park. In Port Perry, the project led to the rezoning of the town’s lands. In the Weston-Mt.Dennis community the blueprint for redevelopment produced at the charrette continues today, as do three non for profit groups that were formed by the charrette’s participants. It was also during this time that the Institute also began its consulting work. Clients like Windsor Essex Community Housing, Sony Centre, TAS Design Build, Dublin City Council, Peel Living, Magna Aftermarket and many others, called on the IwB to consult and develop solutions to challenges which they faced. 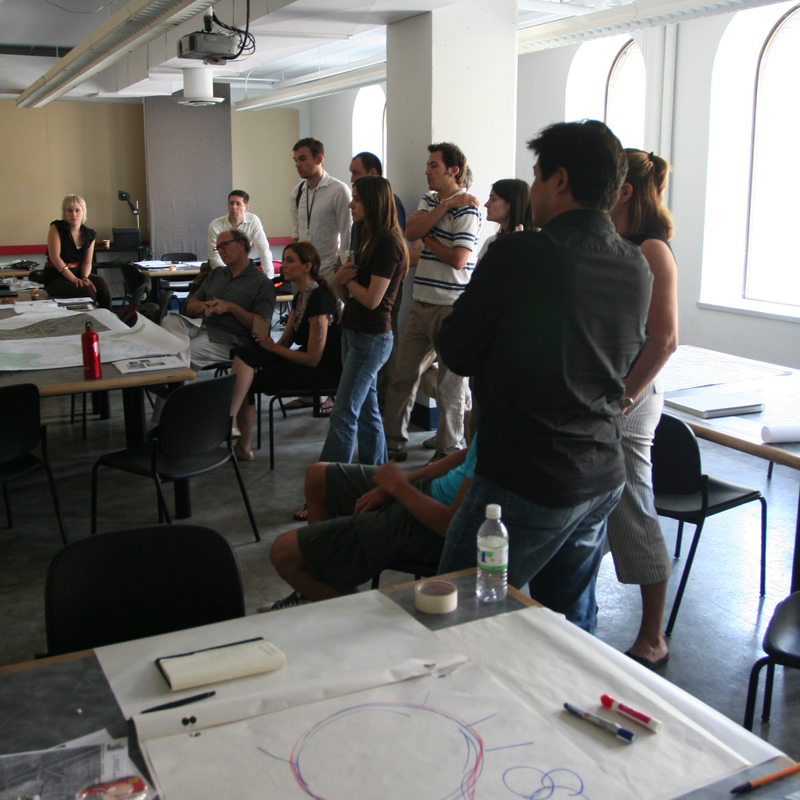 The IwB Summer School in Belgium, which took place 4 years later, also evolved from the Interdesign 2007 prototyping. Below are summaries of the proposals developed at the Interdesign for the case study sites. For the full Interdesign project proposals see the Institute’s World House Interdesign Publication. The Town of Port Perry, located in the municipality of Scugog, was used as a model to investigate planning conservation strategies for growing communities. Port Perry needed to develop environmentally sensitive land, reestablishing its brownfields. By engaging with Port Perry and revisualizing its community gateway commercial development, charrette participants generated concepts that introduced systems design and planning models to promote viable solutions for the issues that face growing communities. The design proposal showed an alternative to the big box retail development by redeveloping the site with the help of the local community. The proposal stressed growth through intensification of the areas between the town and the natural landscape and new connections between the natural and built environment. Most importantly, the proposal emphasized the support of local economies through building spaces for art and crafts manufacturing and residential facilities that could be used by local craftspeople. For the City of Toronto, Lake Ontario is the drainage basin for a wide network of rivers, streams, tributaries as well as storm and sanitary sewers. In the fall of 2006, the Toronto Waterfront Corporation’s decision to move the Sherbourne Park stormwater storage tank underground presented a chance to explore the idea of combining water management with an educational and urban design mandate. The Toronto Waterfront team investigated how a water feature could transform an unused parking lot into an educational space where people could learn about the urban water cycles, also seeing how stormwater and greywater are filtered. The team created a ribbon concept that could serve as an intermediary between land and water, reconnect the public to the waterfront, and act as an educational and entertainment public feature. The design concept collected and treated stormwater and wastewater and returned it to Lake Ontario while also enhancing the social aspects of living, working and playing in the Toronto Waterfront. Downsview Park is the former home of the Canadian Forces Base Toronto. In 1994, revised military and economic priorities caused the federal government to decommission the base and allocate 644 acres of grassland and 1.8 million square feet of indoor space for development as an urban centre for recreation and culture. The design challenge was to help Downsview Park manifest its identity as Canada’s National urban park and achieve its mandate of sustainability. The design team considered how the park could be transformed to accommodate different groups and events without destroying the local ecology or over-taxing regional infrastructure. The team’s proposal focused on how to provide a wilderness escape within an urban context for families and children. It was imagined in the form of a temporary, educational summer camp that would be designed as a model eco-village. The concept included educational stations and bike-transport vehicles, built by the campers on a circuit path, that would lead visitors through the park’s zones. This ‘discovery-cart’ vehicle would be accessible from the central square of the park, allowing visitors to move through the park with all their supplies. The proposal also included extensive branding and signage in and around the park. Surrounded by parkland, Mount Dennis (also known as Weston) is a small neighbourhood located between Jane, Black Creek, and Weston Roads, and the Humber River. The area has a history of industrial and residential use. Its close proximity to historic stockyards and factories made it a desirable residential neighbourhood for workers, but since the 1960s the neighbourhood experienced economic decline, its main streets, once full of thriving businesses, became inactive and were in great need of infrastructural development. The charrette challenge was to create a plan, business model, and vision statement for a community hub that would engage local residents and act as an incubator space with knowledge support amenities. Participants worked with residents to re-imagine the main streetscape in this neglected Toronto community. Building from initiatives already started by the community of Weston-Mt. Dennis, the team proposed a phased strategic plan illustrated as a layered-timeline that shows the physical development of the area over 5 years. The plan included new leisure, creative, and business hubs as well as new transport connections via bike paths and bridges. It proposed a resilient community that sustains creative economy by integrating all aspects of the production and retail processes within its community boundaries.